Do you work for WebStorm? Learning about WebStorm? We can help. "A clean ide for development"
C’est un formidable outil d’amélioration de l’internet. Pour un débutant en amélioration nette, WebStorm est un très bon coup. Si votre PC dispose de suffisamment de RAM, c’est un IDE génial. Nous avons découvert que, sans webstorm, notre équipe de programmation prendrait beaucoup plus de temps à accomplir des tâches, notamment en l'utilisant comme IDE numéro un pour la croissance d'initiatives Internet. Amélioration du Web. Editor de código ligero y funcional. "Embalado com montes de capacidades desejáveis, acelera a maneira de desenvolvimento"
Leia a Documentação Aqueles de nós que usaram este programa de software estão virtualmente satisfeitos, o ponto mais eficaz é o custo, mas vale a pena fazer o investimento Incorporando ainda mais estruturas JS disponíveis. - A veces indica errores que no existen. Lento para cargar hasta en comparación con diferentes IDEs. En algún momento esta aplicación es un consumidor de CPU y este software es propietario y no se puede modificar. Una mejor guía de diagramas UML que podría incluirse fácilmente como parte de la documentación que confirma los diversos requisitos de la industria Para un principiante en el desarrollo de Internet, WebStorm es una excelente oportunidad. Pruebe durante un mes y decida usted mismo. Usándolo como IDE número uno para desarrollar tareas web. Un IDE JS que podría ajustar adecuadamente la función y mostrar la documentación en el hover. Crecimiento del sitio web, CD, desprotección. "It's better than most average products"
The coding assistance provided by WebStorm is the best around. It facilitates very rapid development without having to hunt through documentation all day. The breadth and depth of plugins, both from JetBrains and from the community, is incredible. There are plugins to do practically anything. It's cross-platform, and using the JetBrains Toolbox makes it so it can auto-update seamlessly without me needing to worry about it. The amount of languages and types of projects it can support is pretty staggering. WebStorm can be slow to start up, particularly if it has to reindex the site, it can end up slowing my entire computer down for a little while. This is compounded with having a lot of plugins active. WebStorm can be very resource-intensive. It will happily eat up as much memory as you give it, at least to a point. This is fine if you have a beefy development system, but if you don't have a lot of memory or other resources available, WebStorm can sometimes run quite slowly. Once in a while, using "Find in files" doesn't find certain text strings that do exist within project files. It's pretty rare, but it has caused a hassle a couple of times. "WebStorm is a great asset for developing large-scale web applications"
WebStorm includes a ton of time-saving features, but I'd save live templates are on of my favorites. I can easily create custom code snippets with variables to be filled in whenever I use the snippet, which saves a ton on keystrokes. For example, I have a template to create a new API method where I provide the filename, add the snippet, and press tab a few times. All of the boilerplate code gets added, the function name is generated from the file name, and I can focus on just writing the application logic. Another of my favorite features is the Git Rebase functionality. WebStorm makes rebasing a breeze; once you start the rebase process it prompts you when there are conflicts, allowing you to merge them using the stellar built-in 3-way merge tool (which includes syntax highlighting and ESlint support) then automatically proceeds with the rebase once all conflicts are resolved. Other great features include the TypeScript and Vue support, as well as built-in integration with 3rd party tools such as ESlint, TSlint, and Prettier. Most of my nitpicks are pretty minor. For example, while WebStorm supports both CSS modules in css and scss file and Vue single-file components, it doesn't support CSS modules inside Vue SFC <style> tags. Also, WebStorm can get pretty memory heavy in large projects, sometimes going over 2GB of RAM usage per open project. Another long-standing annoyance for me is that on Windows pressing CTRL+C in Webstorm's built-in terminal doesn't always terminate applications. We use WebStorm as our primary IDE for developing web applications and have used it on numerous projects. The full-project TypeScript integration alone has saved us countless hours and prevented numerous defects. All of the features combine to provide us with a top-notch tool for software development. WebStorm’s intelligent code completion is second to none. WebStorm comes bundled with JSHint and JSLint. JSCS, ESLint, and Closure Linter can be installed via npm. They register as inspections and are customizable through IDE settings. They run automatically and will highlight potential issues. Pressing alt+enter on an issue will allow the user to view suggested fixes. I dislike two things about it. Occasional slow performance. WebStorm can sometimes choke all cores of the CPU. There are numerous reports of high CPU usage. Secondly, it is not open source. This application is proprietary, and thus cannot be modified, freely distributed, or trusted for security. I highly recommend WebStorm to other users. WebStorm have improved our productivity since working with this IDE is powerful but simple and we save a lot of time. For large projects, WebStorm makes it easy to write code. 2. Code Debugging is very smooth. 3. Best part is auto correct options if write wrong syntax it gives you hint that you should use this instead of. 4. integrated Version control system saves my lot of time to resolve conflicts and side by side difference system. 5. Customisable theme options is very cool and I can work in low light as well. - Sometimes auto formatter creates big problem in my case and it's not free although you can have trail version for month but price is little bit high. There are n number of tools for the development but for the front end development I believe this is the best. You can have only one tool which gives extension to version control to local file history and local server as well. It has huge community and there are many plugins readily available to use with webstrom. - It is very easy to adapt for any user. It reduces my development time compare to other IDE. There are n numbers of tool for web development but this one is best among all. "Best IDE for frontend development"
1. all shortcuts ctrl+alt+L and all your code is formatted. 3. AutoComplete shows me what I can use and what I can't. 4. Version Control helps me properly manage my files and add/commit them after checking proper difference and making it easier for me, making sure only right stuff gets uploaded. 5. Debugging is very easy on webstorm. Even when you are not using debugger and you write something wrong, it shows you right away that you have written something wrong. To be honest, Auto formatting sometimes makes the file very long. It is a great tool, and all level users can use it without a second thought. I started using it a year ago and it was adaptable from day 1, but it so features rich that sometimes I discover new features even today. It's terrific for rapid development, debugging and it shows you right there when you are writing something wrong. Very beneficial. Yarn auto detects the package.json changes and auto installs the missing packages. Overall you can just do rapid development with it. "WebStorm es una bestia a la hora de programar." Me encanta la auto-completar inteligente, viene con casi todos los lenguajes pre configurados, la consola dentro de la IDE es esencial, así como el soporte con la mayoría de los frameworks utilizados actualmente. La interfaz de usuario es muy personalizable y tiene un gran número de temas para mejorar la apariencia física. A veces puede sentirse un poco limitado con respecto a la personalización o implementación de características personalizadas, especialmente si está acostumbrado a trabajar con IDEs de código abierto. Este programa es excelente, es altamente recomendable, se recomienda la compra de este software. Incluso ofrecen una licencia gratuita para estudiantes de 1 año o una prueba de 30 días, por lo que mejor probar y ver lo maravillosa que es esta herramienta. Hace tiempo que utilizo los productos de la serie "Storm" para poder decir que son muy estables y constantemente actualizados, puedo hacer el mejor uso de ellos para construir lo que imagino. No puedo prescindir de él. Antes de encontrarme con estos productos, no tenía un IDE favorito para usar en lugar de otro. Ahora, sin embargo, cuando tengo que usar una PC que no es la mía, ¡instalo inmediatamente WebStorm! El mejor! Este programa es excelente, es altamente recomendable y mi empresa está adoptando las medidas para la adquisición de este software e instalarlo en todas las estaciones de trabajo. Aquellos de nosotros que hemos utilizado este software estamos realmente satisfechos, el único punto en contra es el precio, pero vale la pena hacer la inversión. Lo utilizo siempre que hay necesidad en comparación con los competidores es muy fluido y en la salida es instantánea. Muy rápido en cualquier asunto. It comes with practically every tool necessary to start a project or work directly on an existing one. It also comes with awesome integrations for different kinds of development flows. There's not much to say here. The only problem I might have at times is a slow boot time, but once its up and running, everything is seamless. Instead of buying IntellIJ, get Webstorm and cut out all the overhead IntellIJ gives you and quite a few extra tools for Web Dev for a powerful and seamless flow. The principal problem it solves is the sometimes painful development process for big projects. It's our primary tool for developing some of the bigger projects we manage. It solves the "one size fits all" problem for us. It helps the developers here avoid wasting any time getting the development tools necessary for the projects set up which means more time to work on and finding a solution to actual problems. It's also available for every platform we currently use (Windows, Mac, Linux), so we prevent having any problems on the development side of the projects, since we assure everyone is using and looking at the same project. Developers have no problem with using it because you can basically style it however you want, use any linter, and even integrate it with something like VIM (for VIM users). "The best editor for worry-free programming"
I love intelligent autocomplete, it comes with almost all pre-configured languages, the console within the ide is essential as well as the support with most of the frameworks currently used. The user interface is very customizable and has a large number of themes to improve the physical appearance. This application does not have notable contras, the only thing I could say is that the initial load is a bit slow, the price is high although it has a trial version. This program is excellent, it is highly recommended and my company is adopting the measures for the acquisition of this software and install it in all workstations. Those of us who have used this software are really satisfied, the only point against is the price but it is worth making the investment. I am a programmer and it is my daily tool for programming. It saves me a lot of time and effort for the autocomplete that it has incorporated. Fast IDE where are integrated all necessary tools such as GIT, Terminal, linting, debugging. Tool is well designed and comfortable for work. Here is great integration with GIT what allows you to avoid all other programs. You can easely manage you git project, see the graphs and all commits, change history and do everythins you need with user interface or with console. Additionaly, here is great implemented configuration feature. You can manage your code style from settings. set all you and your team needs. It takes too much memory. Sometimes I see notifications about memory limits. Well designed and developed product that supports all languages you need in Web developing. Additional tools are integrated well. WebStorm is a great tool wor web development, debugging and support. It helps to build and deliver well orginized and high quality products. "WebStorm es tu IDE si eres un desarrollador web"
Creo que la mejor propiedad discreta de la Webstorm es que cuando se necesita perseguir una contención de la base de la capacidad se puede hacer con un clic del ratón. De verdad, no hay nada que no me haya gustado de Webstrom. Una cosa que es un tormento es la membresía pagada. Es mínima mente costoso para los "junios". Me imagino que deberíamos mantener este IDE libre para al menos los "junios". Está justificado, a pesar de todos los problemas. Es el mejor IDEs para el avance de la programación. Hay un depurador/preservación dentro del IDE. Todo es ajustable dentro de la GUI de configuración (no hay ningún documento de configuración que aprender y mantener, el IDE lo hace por usted). Dispositivo para incluir efectivamente estructuras y APIs no soportadas. Tiene refuerzos empresariales para algunas estructuras (responder, rakish, hub, require y algunas más). I have been using the products of the "Storm" series for quite some time to be able to say that they are very stable and constantly updated, I can make the best use of them to build what I imagine. I can not do without it. Before I came across these products, I did not have a favorite IDE to use in place of another. Now, however, when I happen to have to use a PC not mine, I immediately install WebStorm! The best! The purchase of this software is recommended. It even offers a free student license. Really great! I use it whenever there is need compared to competitors is very fluid and at the start is instantaneous. Very quick in any matter. WebStorm offers code completion, suggesting what you might possibly be meaning to type in, which is helpful. It offers a built in debugger, supporting FireFox and Google Chrome, which is extremely helpful for web development. It helps eliminate the need to switch back and forth between WebStorm and some debugger application. It has support for external frameworks such as Node, Google App Engine, React, Express, and many more. As with every IntelliJ IDE I have used, it has a great library of plugins and supports installing plugins from disk. My favorite feature that it offers is the UI customization, allowing me to use the Dracula theme, which is perfect as I have a hard time seeing on lighter backgrounds. Another great feature with WebStorm is the ability to commit and push to GIT repos right in the application itself. While WebStorm is definitely full of features and my go-to Node/JS IDE, it does have some issues and drawbacks. As with every IntelliJ IDE I have used, WebStorm does have a pretty large memory footprint. It also can take some time to start up. When accessing multiple projects, each one is opened in a separate instance, which, again, can impact performance. Most IntelliJ IDEs allow you to import a project from files on a remote server, however with WebStorm this isn't possible. You must first create a local project, then navigate through the menus to find the deployment options, and add the server and download the files. Added servers are per project instead of throughout the IDE as a while, to me, this is the biggest drawback/annoyance with WebStorm. We had recently switched from using PHP as our back-end to Node and WebStorm helped with the development, allowing us to develop the back-end quicker and more effectively than other alternative IDEs. "Best IDE for front-end development "
2.) Inbuilt debugger: Very helpful for web development. You don't need to switch back and fourth between browser and IDE, as Webstorm comes with inbuilt debugger which you can use to debug your application. It has support for firefox and chrome. I am not sure about the other browsers. 3.) Support for external frameworks: It provides a greate support for external frameworks such as, Google App Engine, Angular JS, React, Node, Express and many more. 4.) Customization is possible: You can infact add custom menu as per your needs. This is sometimes very helpful and handy. 1.) It takes quite a bit of time to open up at the first time. 2.) It doesn't open multiple projects in one IDE. If I need two projects to be opened, Webstorm open it in two separate IDE which is performance intensive. Definitely recommended. Especially for front end development. Makes life very easy. "Probably the best JS IDE there is"
-Build to be keyboard-centric, every menu is searchable, all shortcut can be changed, a new shortcut can be added. -The UI is 100% customizable and offer out of the box a few great themes. One of the best IDEs around when it comes to web development. The quality of work has improved due to the high customizability of Webstorm. As each developer is unique, they need to customize their IDE according to them. WebStorm’s Settings dialog it’s known for its live search feature. If you don’t agree with the way that WebStorm indents your code, you can simply type “indent” and the tool will only select the categories related to indenting code. The vast array of configurable functionality makes this IDE stand out above the rest. Beginners might get overwhelmed with the amount of functionality is provide. Its like a double edged sword! Text editors are great but you haven't experienced agile development if you haven't worked with a real IDE (like WebStorm). One of IntelliJ's best products. It makes writing web and mobile applications easy and fun. "An IDE that makes development pleasant and fast from day one"
The best thing about WebStorm is that it comes with almost all the features that you can desire preinstalled. It is unlikely that you will need to add many plugins, as it's usual with most editors. This makes development enjoyable and fast from day one. It has a great ability to predict the content of fields and code navigation is very powerful too. Sometimes you might feel a bit constrained regarding customization or implementation of custom features, especially if you are used to working with open source IDEs. Learn about all it's built-in features in advance to maximize the productivity boost. Development times are shortened thanks to it's powerful autocomplete and reference features. Also, code formatting makes projects more readable and with syntax highlighting you can greatly reduce the amount of coding errors and typos. WebStorm offers great troubleshooting alternatives and helps developers to create neater code. The plugin repository is likewise broad. Sometimes webstorm tends to be slow in processing result, this may be due to what the software is built on. Also purchasing an extra license from jetbrains is costly but it worth it. Suggestions option is too much that it may be confusing at times which option to follow. For a newbie in web development, WebStorm is a very good shot. I recommend it for executing a big project because it helps the workflow. I use webstorm for a lot of projects like ionic app development and building angular websites. It helps a lot in solving my website development projects. It's very easy to write the code without any complexity. For more complicated projects also, we can easily write and debug the code. We can easily identify the errors by using analysis feature. It's very useful to write the nodejs code. As a beginner of nodejs I struggled with the syntax, in Webstorm It's very easy to handle the syntax problems. It takes lots of time to creating a new project as well as to open an existed project. Some times it will get struct while coding. It's very useful for large scale projects. After completion of coding, we can easily store the code in GitHub. For beginners of a new language, it's very helpful as they don't know much about the syntax. Error handling is easy. For large scale projects Webstorm is very useful to write the code. We can easily connect to the GitHub and clone the projects. After writing the code we can easily store in GitHub. Le suivi n'est pas idéal Peut-être que pour des fonctions d'extension, une charge est recherchée Cet utilitaire est propriétaire et ne peut donc pas être modifié, distribué librement ou approuvé pour des raisons de sécurité. C’est l’un des meilleurs IDE pour la programmation côté acheteur. Si vous êtes le développeur de la première ligne ou la société d’amélioration de la première ligne, vous pouvez utiliser ce produit sans aucun doute. WebStorm has a fantastic indexing engine that really helps autocomplete, refactoring, and navigation through a given codebase. You can simply open a directory (whether it be for a single project or multiple) and WebStorm will quickly organize everything appropriately. It's very easy to use, and developers will be able to get up and running quickly. Because WebStorm is written in Java, it can get a bit sluggish and become very resource intensive depending on the size of the project. As a result, it's important to keep the number of open JS apps/projects to a reasonable minimum. There are so many preferences and options in WebStorm, it can be difficult to know which things you should change. Additionally, some preferences are specific to the project whereas others are global, and the difference is not always easy to understand. After using Eclipse for a time, we're realizing faster and more efficient development cycles, because we don't have to fight against an IDE that was designed to "do everything." 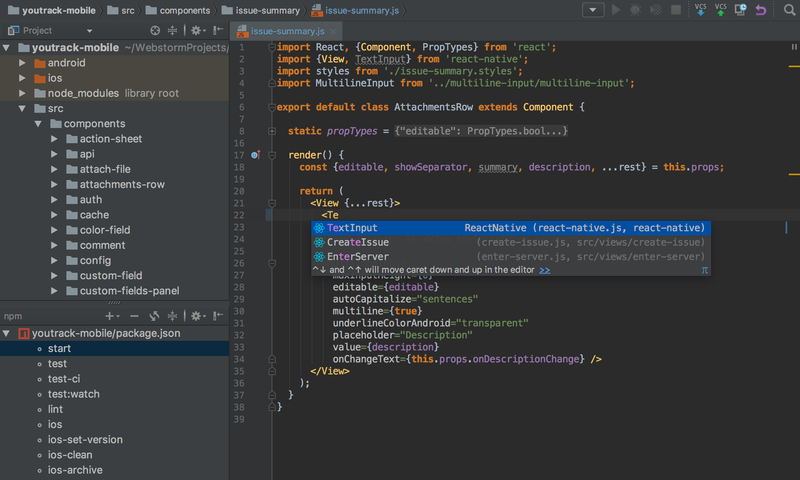 WebStorm is focused on making JS development easy, and it does that with aplomb. Over the years, similar alternatives have become available that rival WebStorm. VSCode provides everything WebStorm offers and I personally find it a little faster when starting and loading a new project into the IDE. WebStorm still feels like an Enterprise IDE, instead of a fast and useful tool. 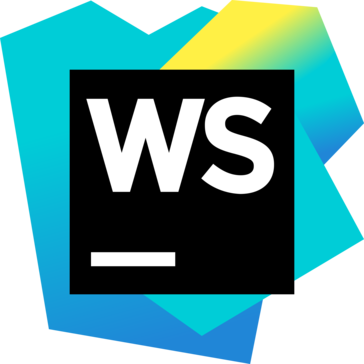 WebStorm is great if you are already familiar with the Jetbrains ecosystem, otherwise, there are better/free alternatives like VsCode. If you have purchased as part of the suite, then you will likely benefit from the value it offers. For a beginner/hobbist learning/implementing any frontend tech stack, you might find you are overwheled a little with everything WebStorm offers. Most of it, you may not need until you become a power use of the IDE and proficcent in the stack. It was fantastic whilst working on an Angular 1.4 project. It allowed me to stay within the IntelliJ ecosystem where key bindings and the editor were familiar. This was incredibly useful when switching between multiple languages and editors. "Webstrom OK but there are better things in market"
The only thing I dislike about webstrom that it is another skill, things are not automatic for example in case you want webstrom to read your jscs, tslint etc you would have to configure them. I was hoping webstrom to read them by default. Even after reading them the default code style is different from JSCS, you could set keyboard strokes to mimic ctrl-alt-l feature but it is not same as default code style. Webstrom is very powerful but to find its gems you would have to find them. They are not spoon fedded to you. I have not used it but I belive visual studio code is gaining popularity because of its ease of use. code cleaning and auto code generation. "Easy to learn, great support"
Out of the box experience is great. It's very intuitive to configure themes and syntax format I prefer. The plugin repository is also very extensive. Typescript support is great with different refactoring features. If you work on different languages, say frontend is Typescript + HTML + CSS and backend is Java, you'll have to purchase Webstorm and IntelliJ licenses which are quite costly. I use it as my primary IDE. I've been using it for 4 years and increases my development efficiency a lot after learning the code search shortcuts and refactoring features. ""WebStorm is an extraordinary resource for growing vast scale web applications""
WebStorm incorporates a huge amount of efficient highlights, yet I'd spare live layouts are on of my top choices. I can without much of a stretch make custom code pieces with factors to be filled in at whatever point I utilize the scrap, which spares a ton on keystrokes. For instance, I have a format to make another API strategy where I give the filename, include the bit, and press tab a couple of times. The majority of the standard code gets included, the capacity name is produced from the document name, and I can concentrate on simply composing the application logic.Another of my most loved highlights is the Git Rebase usefulness. WebStorm makes rebasing a breeze; when you begin the rebase procedure it prompts you when there are clashes, enabling you to consolidate them utilizing the excellent inherent 3-way blend instrument (which incorporates grammar featuring and ESlint support) at that point consequently continues with the rebase once all contentions are settled. Other extraordinary highlights incorporate the TypeScript and Vue support, just as implicit mix with outsider apparatuses, for example, ESlint, TSlint, and Prettier. A large portion of my nitpicks are entirely minor. For instance, while WebStorm underpins both CSS modules in css and scss document and Vue single-record segments, it doesn't bolster CSS modules inside Vue SFC <style> labels. Likewise, WebStorm can get pretty memory substantial in expansive activities, once in a while going over 2GB of RAM utilization per open venture. Another long-standing inconvenience for me is that on Windows squeezing CTRL+C in Webstorm's worked in terminal doesn't generally end applications. This program is superb, it is exceedingly prescribed and my organization is embracing the measures for the procurement of this product and introduce it in all workstations. Those of us who have utilized this product are truly fulfilled, the main point against is the cost, however it merits making the speculation. We use WebStorm as our essential IDE for creating web applications and have utilized it on various ventures. The full-venture TypeScript incorporation alone has spared us endless hours and kept various deformities. The majority of the highlights consolidate to give us a choice device for programming advancement. "Powerful, clean & user-friendly IDE for development"
There are a variety of features that make this IDE stand out from all the ones available in the market. 1. Customized themes for low light and dark light environments such as Dracula & Light. 2. Integration with various version control systems such as Git, Github, Mercurial etc. 3. Auto Completion of text is really helpful in coding. 4. Creation of custom code templates and snippets and use of suggested variable names is a huge plus. 5. Running and debugging of code is quick and easy. 6. Multiple plugins for various frameworks and languages and support for Chrome/Firefox for web development. There is not much to dislike apart from a bit slow boot time for the application and memory consumption on low configuration systems. This tool provides numerous enhancements and features to create high-quality code that could be easily migrated and read as per the business requirements and allows the developers to efficiently code and deliver. The business our organization serves involved strict rules and regulations regarding the quality of code such as the nomenclature, indentations and code structure. With inbuilt custom templates and ease of use, the developers efficiently produced high-quality code that could easily be debugged. "One of the best IDE's available"
Sometimes it can take a while for WebStorm to actually open up and fully load the code. There was also a semi-steep learning curve, like with many other advanced IDE's. The biggest con against the entire JetBrain lineup of IDE's is their price. It is a very steep amount, but luckily they do offer student free one year licenses that can be renewed as well. Definitely give it a try. It is a pricey ide, but well worth it's price. if you are a student then you can get it for free as well. I am currently using WebStorm as my preferred IDE for interview preparation. Overall it helps me a lot with code completion, and speeding up my development time. I do feel that almost everything can accomplished with a vanilla IDE as well though. My favorite thing about WebStorm is getting to use a powerful IDE without the overhead of tooling for many technologies that I don't use. I do dislike how difficult it can be to customize everything perfectly, but once it is all set up I have no complaints. I frequently use both WebStorm and Visual Studio because I am required to use VS for my work. However, I do 99% of my work in WebStorm and really enjoy how quick and efficient it is to use. It makes VS seem painful in comparison, and I can't imagine how frustrated I would be if I needed to use Visual Studio for all of my coding. WebStorm is a powerful IDE with built in terminal window, and testing tools. "Really awesome IDE focussed on JS based web-development"
WebStorm provides superior debugging options, has lot of features that helps developers to writer much neater code improving code quality quite a much. Internal static code analysis helps capture basic code improvements before the code goes into more serious level enterprise code analysis tool. Code suggestions are really good wherein latest ES6 or such standards are taken care of for developers. Provides lots of browser features inside IDE itself which is cool for testing/debugging. Documentation/Diagram generation tools could be made more robust confirming to industry adopted standards so that the diagrams actually represent whats coded. Static code analysis could be made even better. Better UML diagrams support which could be easily incorporated as part of documentation confirming to various industry standards. Incorporating even more JS frameworks out there. Enterprise JS based front end web-applications development. Improvements in code review cycles, actually shortening it to release features for testing earlier. Strong debugging/testing features covers more testing scenarios to be addressed earlier in development. -Integrated Version control system saves me lots of time to resolve conflicts and see different systems side by side. -Customisable theme options are very cool and I can work in low light as well. Those of us who have used this software are really satisfied, the only point against is the price but it is worth making the investment. Try for a month and decide yourself. As programmer and it is my daily tool for programming when it comes to angular/angularJS. It saves me a lot of time and effort for the autocomplete that it has incorporated. It gives you (as developer) smart autocompletion and syntax suggestions if you are using ES5, ES6 and ES7, Typescript, JSX, Dart, Go and even if you are developing with frontend frameworks such as Angular.js, React.js, Angular 4, Vue.js. If you're working with node.js and NPM, it gives you shortcuts to improve the process related with packages installation, libraries dependencies, and schedule tasks. Moreover, this IDE provides with tools that allows you to develop Mobile Hybrid Applications based on frameworks such as React Native, Native Script. It should add support to the Exponent (expo) platform. It should add better support for Ionic. It should add better support for Electron. "Powerful IDE for web development"
First of all, it's a very familiar IDE for anyone who has used other JetBrains products such as IntelliJ. Using the same interface and keyboard shortcuts can be surprisingly helpful for productivity. All useful features, like the powerful refactoring, are there. Unless you're working on a huge project, WebStorm might be TOO powerful - it uses a lot of resources on your machine, which might be noticeable when you need to run several other tools at the same time. There's a free trial on the website. You can also use other free IDEs from JetBrains (such as IntelliJ) to get an idea on how it works. We are using WebStorm as the main IDE for our web project, which contains lots and lots of lines of code. Using templates, smart auto-completion and refactoring are essential to maintain productivity at scale. And if you miss something, you can install a lot of additional plugins to have it. There is not a free version as IntelliJ Community. If you want to try it, search the EAP version. The main benefit is that it helps me at writing, testing and debugging my code, letting me to save a lot of time when doing these tasks. "Pretty easy and cool for java script frameworks"
There aren't many tools which suggest you in java script based frameworks.Web storm suggests which is cool. Also, it is very easy to include external libraries in this. It is slow at times. A bit heavy tool. Otherwise not much to dislike. While many processes are running on my laptop it becomes difficult to run the tool. but it depends on the RAM is what I think as for now. Good tool for js based framework.. must recommended. I have used it for both front end and backend. Web development usign nodejs and vue js. It is very fast . Also it shows me the compile time error as java, which is quite convenient. I have used it for developing tools based on Web which includes front end and backend.